Don’t let cold air, wind and rain dash your hopes of a fashionable haircut this season. 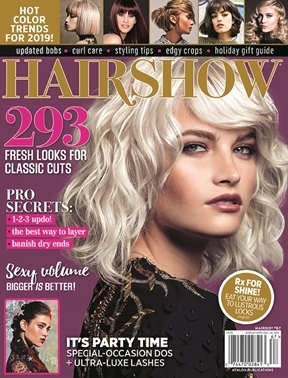 This issue of HairShow features 100s of options that will have you looking and feeling wonderful despite the weather outside. • Learn how to master a perfect special-occasion updo at home. • Trouble with tangles? A Beverly Hills pro explains how to sort out a hairy mess so you can live a knot-free life! • Holiday stressors can lead to breakouts, dark circles, puffy eyes and more, but our beauty solutions will help you survive—and thrive! • Try six inventive new ways to use dry shampoo—yup, there’s more to this industry fave than a quick refresh between washes. • Wow the beauty junkies in your life with our gift guide, packed with fun finds for every budget.